i def gotta get that book! William is always fun to see in a picture, especially when playing a "bad" guy! i've only seen 14 of the films on that list so plenty more to go! and i STILL have not seen Match King, ack! Thanks very much for this review; I've added the title to my list of books I'd like to read. 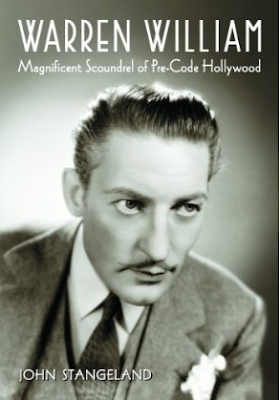 I've become interested in Warren William as I've become more and more interested in pre-Codes, and your description sounds like a very worthwhile book. I know pretty much nothing about William outside any of his films which I've seen! I'll head over and read Cliff's review now. Thanks much for the mention, Raquelle! Yes, very hard from my boots to spot the biases (except maybe the quick dismissal of Japanese internment camps near the end), but obviously the author is a fan of the star--in a book like this I hope he would be. I thought he avoided anything approaching the gushing of some lesser fan bios and steered more towards hard, even academic, biography. The most pleasant surprise for me was that, yes, the films were covered, but the actual life of Warren William was more of the focus and speaking from experience, that life isn't easy to uncover! Thanks so much for reviewing John's book and helping to spread the legacy of Warren William. Thanks for this review, Quelle! It sounds like a great book, and I for one am interested in a detailed look at Warren William's life. Warren William is great fun! Those 1930s Perry Mason films are a stitch--so different from Raymond Burr et al!